It was the week of October 31th 2010 and I found myself working in NJ. Fortunately, I was only a short train ride away from Manhattan where my kid lives as a student at NYU. I often visit my kid when in town and my kid always finds interesting things for us to do, and Friday night she didn’t disappoint. After a round of truly awesome Swedish meatballs from Aquavit, we headed to Chinatown to see a real video arcade! Arcades, once common all over the US and NYC, are dwindling towards nonexistence. 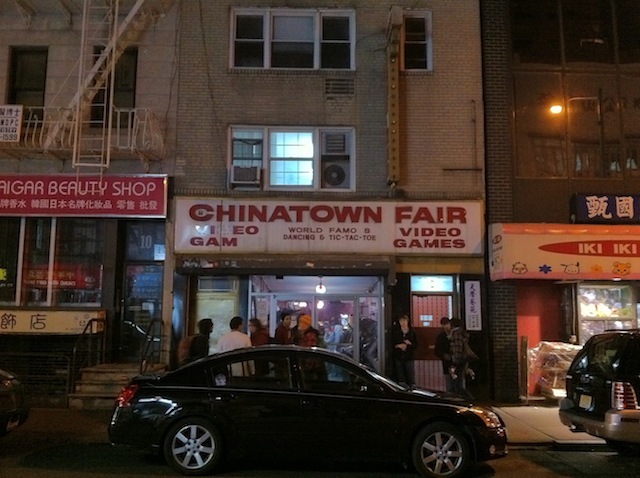 Little did I know last November that the arcade my kid took me too is the last arcade in NYC according to this article: The Odd History And Uncertain Future Of Chinatown Fair, NYC’s Last Great Arcade. According to the article the arcade is here to say, but may relocate. I love how eclectic Chinatown is and I hope Chinatown Fair stays for a very long time. BTW, my kid and I vacationed to Tokyo last spring. There were no shortage of arcades. Tokyo is my Disneyland. This entry was posted in game, nerd, retro, trip on February 23, 2011 by Egan Ford.